Walt Disney loved animal movies and his studio churned them out as often as possible. It's surprising that a 1938 novel called The Ugly Dachshund by Gladys Bonwyn Stern wasn't adapted by the studio earlier. This canine twist on the classic fable The Ugly Duckling must have seemed like the perfect addition to the studios cannon of films. Walt assigned directing duties to Norman Tokar, who had already directed a handful of animal films for the studio. Winston Hibler co-produced the film. Albert Aley adapted the screenplay for his only Disney film. Dean Jones filmed this directly after wraping production on That Darn Cat. Suzanne Pleshette makes her Disney debut playing opposite Dean Jones, who she was frequently paired with. Another familiar Disney face is Charles Ruggles as the vet, who had small roles in The Parent Trap and Son of Flubber. One of the Great Dane actors named Duke is also a Disney veteran, having played one of the family dogs in Swiss Family Robinson six years earlier. Renowned Japanese actor Mako also has a supporting role. The film was shot entirely at the Disney Studio in Burbank. The film begins with credits over a matte painting that zooms into the home of Mark and Fran Garrison. They are in a rush to get to the vet because their Dachshund is about to give birth to puppies. Mark is sad when he finds out all three puppies were female, but when he sees the vet's Great Dane has had a litter of puppies and expresses his jealousy, the vet urges him to take home the runt of the litter. When Mark arrives home with all four puppies, Fran in her excitement doesn't give him a chance to tell her the boy isn't one of theirs and she assumes he is also a Dachshund. Frank names him Brutus, but when Fran realizes he isn't a Dachshund she returns him to the vet. After Mark gets depressed, she surprises him for his birthday by getting Brutus back. From the minute Brutus returns, the Dachshund pups create messes that Brutus gets blamed for. After ruining a backyard party, Fran wants to get rid of him again, but doesn't have the heart when Brutus saves one of the Dachshunds from a trash compactor. While Fran is training one of the pups to be in dog shows, Mark and the vet secretly train Brutus. Against the odds, Brutus wins "best of breed." The film ends with Mark putting Brutus' blue ribbon on the wall next to Fran's dachshund's ribbons and the whole family being happy. 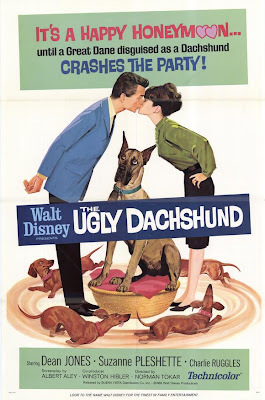 The Ugly Dachshund premiered on February 4th, 1966 and was released on February 16th. It was paired with the long short Winnie the Pooh and the Honey Tree, the first appearance of Disney's version of the "silly old bear." The pairing was a box office success, earning more than $6 million. Despite the success, it was never rereleased to theaters. It made its TV debut in 1968 and arrived on home video in 1986. The best word to describe The Ugly Dachshund is "cute." There are a few moments that will have you genuinely laughing, particularly the reaction of two Japanese caterers who mistake Brutus for a lion. 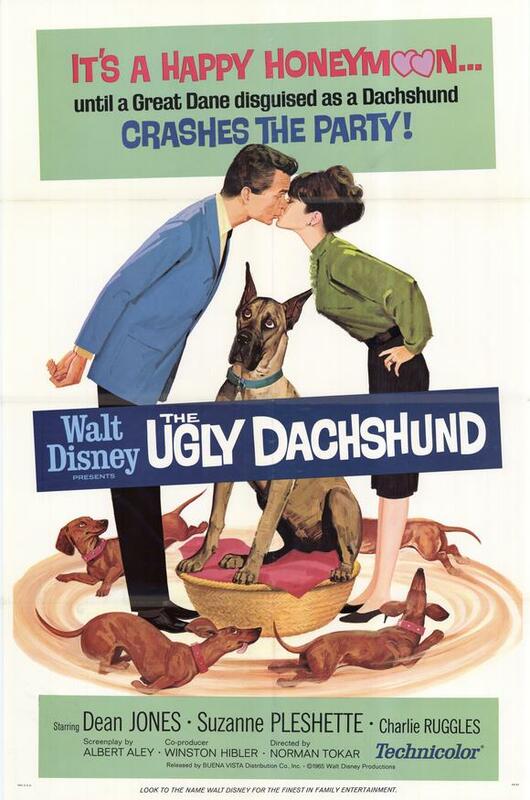 As a Disney animal comedy, it certainly serves up some laughs and plenty of canine stars. What it lacks is an emotional core which isn't necessarily a bad thing, but it explains why it isn't as revered as films like Old Yeller or even The Shaggy Dog, which has a father and a son who don't understand each other. If you like films like That Darn Cat, you will most likely enjoy this film too. Suzanne Pleshette reportedly had to shower at the studio before returning home from filming because her dog would smell her animal costars and get upset. Viewers with a keen eye will recognize many of the Studio filming locations, including residential street and the exterior of the office buildings. The exterior of the Garrison house was newly built for this film. The Ugly Dachshund is currently available on DVD. The film is presented in its original theatrical widescreen aspect ratio of 1.75:1. A minor restoration was done and the film looks pretty good, although there are some flaws and instances where the image flickers. Bonus features include an interview with supporting actor Mako, a musical montage of Disney dogs and the original theatrical trailer from 1966. The film is also available in a 4-movie collection with The Shaggy Dog, The Shaggy D.A., and the Tim Allen remake of The Shaggy Dog. The film is also available on iTunes, where it can be purchased in HD, but you don't get any bonus features that way.